"Find the Future" combines digital and real world challenges at a New York public library. (CNN) -- When Jane McGonigal was 21 and a bit listless, she went to the New York Public Library to reinvent herself. She read up on computer science and physics and used that knowledge to apply to a graduate program in game design in California. "It's just the kind of space where you come inside and you feel something," she said of the library. "You almost feel like you could think bigger thoughts or dream bigger dreams." 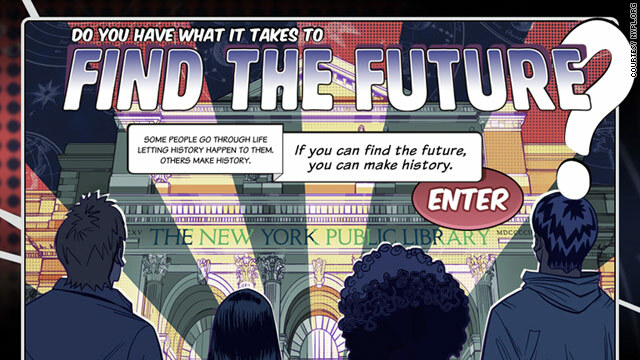 Now one of the world's hottest game designers, McGonigal is trying to recreate that experience with a smartphone-based game called "Find the Future," which combines a real-life scavenger hunt at the library with digital challenges. The game's website goes up Friday at 9 a.m. ET and the actual game begins on May 20. Starting Friday, though, people can enter a contest to become one of the game's first 500 players. Those people will get to stay in a New York library overnight on May 20 to kick off the game, which continues through 2011. Players download an app on their Android or iOS phones and then go to New York's Stephen A. Schwarzman Building to play. As they wander the halls of that landmark structure, which celebrates its centennial this year, they take pictures of QR codes that are attached to 100 of the library's notable objects. At each object, players meet a challenge. When they find writer Charles Dickens' letter opener, which, bizarrely, is made out of his dead cat's taxidermied paw, they get a prompt that asks them to write an open letter to someone they love. When they find a draft copy of the Declaration of Independence, which has scribbling in the margins that suggest Thomas Jefferson was trying get the Founding Fathers to ban slavery, they're asked to write a declaration of their own. "You see that and you think this wasn't just some moment in abstract history. This was a man who was trying to stand up for what he believed in," she said. Players can submit responses through their phones or online, and other people can view these posts on the project's website. For those who can't go to the library, certain challenges will be "unlocked" online as the year goes on. If players complete enough challenges, they can compile their writings and the writings of others into a book, which they can have printed for a fee. The book that the first 500 players compile together will be bound and stored in the library. McGonigal hopes the challenges will bring history to life and inspire people to create some history of their own. "The library's collection has all of these rare and just precious, awe-inspiring objects that you really have to come face to face with," she said. "It's one thing to look at it online and it can really have some impact, but when you're there it really becomes clear that for every moment in history there was a person who set that moment in action -- and you could be that person." McGonigal, author of "Reality Is Broken: Why Games Make Us Better and How They Can Change the World," and a speaker at brainy conferences like TED and SXSW, is known for creating digital games that compel people to take real-world action. In 2007, she created a game with the Corporation for Public Broadcasting that encouraged people to imagine a world without oil. Last year she developed a game with the World Bank Institute that aimed to empower people in Africa to start businesses. These ideas fit within a category of technology that some people are calling "gamification." At a keynote address at South by Southwest in March, SCVNGR founder Seth Priebatsch declared this the "decade of games." His app, like others, gives people points and rewards for completing everyday challenges. McGonigal is fond of saying games inspire the best in people . Gamers are passionate by nature, she says -- they just need to have those passions unlocked in the real world as well as the digital one.